This recipe will work for your wild turkey or a store bought turkey. I’m not a big soup and stew kind of guy, but as I get older, I do find myself eating more of both of them. Especially when it is cold outside. But today I want to share a recipe that I came up with a few years back that my family really enjoys, and that is turkey stew. Turkey stew is super easy to make but unbelievably good. The backbone of the stew will be the bones and fat left over after you eat your smoked turkey. I came up with this recipe years ago after we had finished eating a smoked turkey that mom always sends us on Thanksgiving. She sends us a Greenberg smoked turkey, which is out of Tyler, Texas. Greenberg makes the best smoked turkey I’ve ever tasted. One year after we had polished one off, I hated to throw away any precious meat left on the bones and thought “Hmmm, I’m going to make some stew out of the leftovers.” It’s an every year event now. 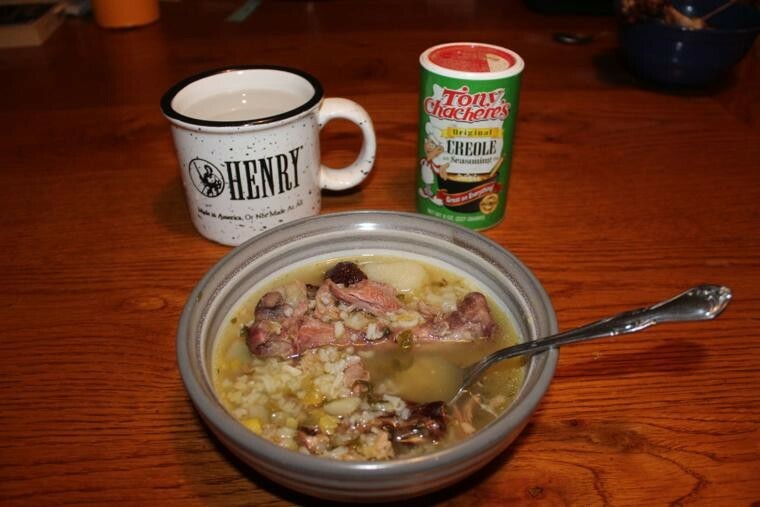 You can make this turkey stew out of a Greenberg smoked turkey or out of you own smoked wild turkey. The ones from Greenberg come in a plastic bag stuffed in a paper sack. I put all of the bones and skin (fat) in the plastic bag and store in the freezer until I’m ready to cook it. So here’s how to make the stew. It is best in a Lodge Dutch oven. Put 4 to 6 inches of water in the Dutch oven and heat it up on your stove top, or I guess you could do it in your oven. Right when you start heating the water I put in the ingredients. I throw the bones and fat in then. Since we love the stew so much, I make two batches out of one set of turkey bones. 1-2 teaspoons of chopped garlic. I use bottled garlic. Half a bundle of chopped cilantro. Cilantro is what makes the stew so don’t leave it out. Tony Chachere’s seasoning and a little salt and pepper. Bring all of the above ingredients to a boil. When the potatoes are done, throw in ¾ cup of instant rice. Let it cook for 5 to 10 minutes and you are now ready to serve. I scoop out everything with a big spoon and put in the bowls, leg bones and all. (I semi-separate the bones before cooking so all of the flavor is absorbed while cooking). Then we have a plate on the table to put the bones after you have eaten all the meat off of them. This sounds like a simple recipe, and that’s because it is. But don’t let it fool you. It will be the best turkey stew that you’ve ever had. So just because you’ve sliced every last ounce off of your smoked wild turkey this spring don’t think it’s over. No sir, whip out a steaming pot of turkey stew and impress everyone. It is also great with homemade sourdough bread, but that will be another article down the road.